Welcome to another edition of This Week in American History. It has been a busy, yet troubling two weeks. 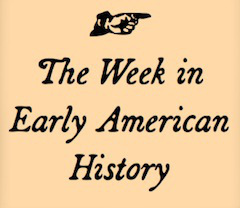 This has been a momentous week for early Americanists, with the 150th anniversary of the Lincoln assassination to start the week and, especially for those of us in Massachusetts, the annual commemorations of Patriot’s Day this weekend. We have lots of great links for you below the fold!